IRD North Mayo West Sligo ltd wishes to recruit an Acting Assistant Supervisor to their Community Employment Scheme for the fixed term contract of one year. The Acting Assistant Supervisor will work with the Acting Supervisor to deliver the Community Employment Scheme aims and objectives while supporting both Communities and participants in their development. Salary: Department of Social Protection, CE Supervisor scale. Pay scale as per Community Employment Assistant Supervisor rates of pay – 4 incremental points. An understanding of the role of the Assistant Supervisor in relation to the running of a CE scheme and the purpose of the CE scheme in developing its participants personally and professionally, while delivering necessary supports to community groups. A minimum of 1 year experience in a Supervisory capacity having developed the skills to manage people on a daily basis. Experience in office administration, HR, Health and Safety and excellent IT skills. Must hold a Level 6 Major Award in Business Administration, HR or related discipline. Must hold a full, clean driver’s license and use of a car. The role will require flexibility and a commitment to the values of community development in all its’ forms. The role will require flexibility and a commitment to the values of community development in all its forms. An understanding of the ethos of IRD North Mayo West Sligo Ltd and its community development activities would be advantageous. Applications to be submitted by email only. Please submit a cover letter and CV to hr@moyvalley.ie by close of business on Monday, 29th April 2019. 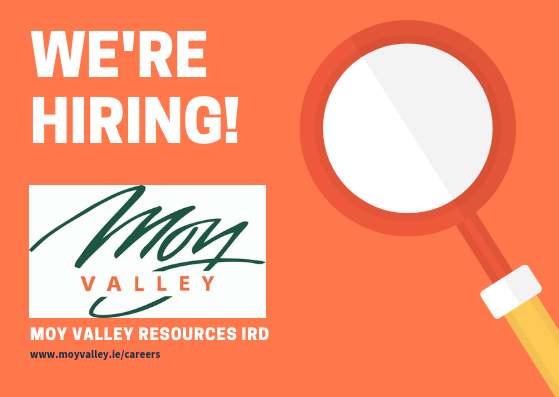 IRD North Mayo West Sligo Ltd (t/a Moy Valley Resources) is an equal opportunities employer and welcomes applications from all interested persons. The following vacancies are available on the IRD North Mayo West Sligo Community Employment Scheme at this time. Anyone interested or requiring further information, please contact Annette on 096 70905 or Jacqui on 096 80095. Applications should be emailed to hr@moyvalley.ie. All participants on CE must meet the minimum eligibility criteria of being in receipt of a qualifying payment from the DEASP for one year and this can be checked out in your local INTREO office or with your case officer. All our our CE roles are developmental opportunities and no experience is necessary. Accredited training will be provided to support your career. As an employer we will work to ensure our employees are given every opportunity to thrive in the work place and to participate in training and upskilling. We also offer flexibility in working hours and aim to give our employees a broad range of experiences while in our employment. Excellent communication (both written and verbal). Previous sales experience preferred (including retail). An interest in marketing and/or sales. Preparation of rooms for meetings etc. Suitable candidates will have a good knowledge of health and safety in the workplace and have an understanding of the need for confidentiality and privacy. The successful candidate will be required to be flexible in their approach to time worked. Please note that garda vetting is required for this role – this will be organised by Moy Valley Resources IRD prior to commencement of the role. Directly communicating with the public on local attractions, events and activities. Ensuring stocks of literature and maps are replenished at all times. Provide support to the Ballina Chamber of Commerce activities. The candidate will be requested to wear a uniform for this position. Weekend work will be required on a rota basis. General administration; updating and maintenance of club spreadsheets, filing, organising and maintaining records while respecting Club confidentiality rules. Answering phone, dealing with enquiries, taking bookings and membership details and organising and assisting with fundraising activities. Communicating with Parents via email, text and face to face. Assisting with presentation of swimming certificates after each set of lessons. Additional duties are to support other festival and community groups in the area. Carpentry, joinery or other practical skills would be highly beneficial but are not a necessity.